Christine writes: I feel technologically challenged. I have a Word Document. How do I convert it to a PDF file? I downloaded Adobe Reader. Every time I click “Convert,” Adobe wants to be paid. I thought you can do this without paying. Hi Christine! So, good news: it’s actually quite easy to convert a Word document into a PDF, and you won’t have to pay a dime to do it. In fact, here’s the rule of thumb when it comes to turning documents or even web pages into PDFs: if you can print ’em, you can convert ’em. Mac users are especially lucky in this regard, as the ability to “print” a document to a PDF comes built into the Mac operating system. Windows, on the other hand, doesn’t have its own, native “print-to-PDF” tool, but never fear—that’s easily fixed. So, want to turn a Word document into a PDF? First, open the document, using either Microsoft Word itself or the Mac’s own Preview app. Got the document open? Now, click the File menu in the top-left corner of the document window, select Print, then click the “PDF” button in the bottom-left corner of the Print window. Next, select an option from the menu, the easiest being “Save as PDF.” If you choose this option, you’ll need to pick a destination for the file (such as the Desktop), then click Save. Your newly converted PDF should appear within moments. Among your other choices from the PDF drop-down menu: “Open PDF in Preview” (to convert the document to PDF and then immediately view it in the Preview application), and “Mail PDF” (to attach the PDF to a new email message). Last but not least, remember that you can perform the same “print-to-PDF” trick in any program with a Print menu, from Safari and iPhoto to Mail and Messages. You can choose a virtual PDF printer from the Windows Print menu, but you’ll need to install a third-party PDF converter app first. Windows doesn’t come with its own “print-to-PDF” ability, but that’s OK—we still have a few easy options. 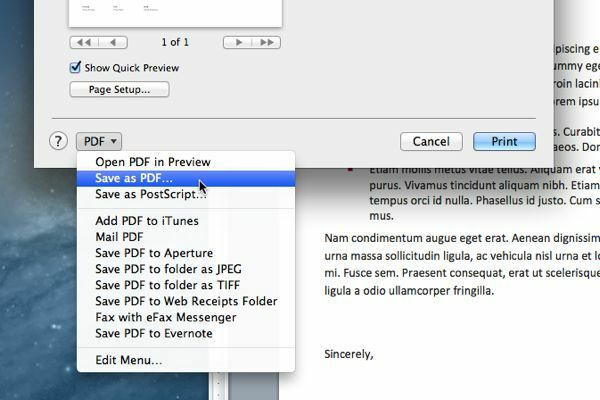 One is to see if the program you’re using will let you save or “export” a file as a PDF. In the latest version of Microsoft Word, for example, just click File, Export, Create PDF/XPS Document; then, in the “Save as type” pull-down menu, make sure “PDF” selected before clicking the Publish button. No “Save as PDF” option in the particular program you’re using? In that case, we’ll have to download and install a third-party app that’ll do the job for us. If you do a Google search, you’ll find dozens of options; I eventually settled on doPDF, a free, no-frills PDF converter. 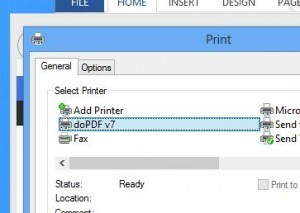 Go ahead and install doPDF or a similar program; once you do, the app will create a new, “virtual” printer on your Windows system that can “print” a document to a PDF file. Next, open a text document, a web page, or any other file you want to convert into a PDF, then open the Print menu (typically File, Print). Click the Print button, select a save location, and voilà: your converted PDF file should be waiting for you within seconds. Hope that helps, Christine. Still have questions? Let me know! Update: In my original post, I neglected to mention that Microsoft Word has its own “export-to-PDF” ability. Thanks to the readers who pointed this out, and apologies for the goof! Mac tip: Why do Outlook mail messages arrive as “winmail.dat” attachments?